A jury is recommending life without parole for a woman convicted of capital murder in her granddaughter's running death. 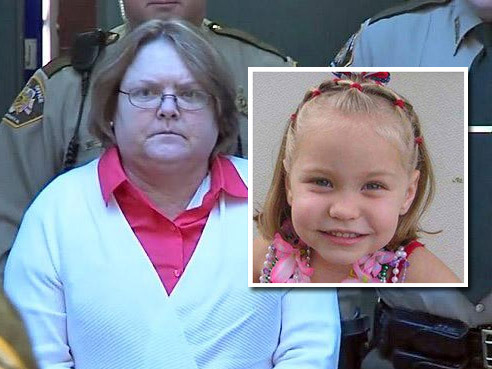 Jurors, in a non-binding recommendation, rejected prosecutors' pleas for a death sentence for Joyce Hardin Garrard in the February 2012 death of 9-year-old Savannah Hardin. The decision came on a split vote: seven for life, five for death. It came Thursday on Garrard's 50th birthday. Under Alabama law, a vote of at least 10 of 12 jurors was required for the panel to recommend death. A simple majority could recommend life. The verdict is only a suggestion under Alabama law. Circuit Judge Billy Ogletree will make the final sentencing decision at a hearing May 11. The same jury convicted Garrard of capital murder last week. Assistant District Attorney Marcus Reid asked jurors to recommend the death penalty, adding that he's never prosecuted a case like this one. "This case is the only case I know of where the perpetrator forced the victim to participate in her own death," he said. Prosecutors contend Garrard made the girl run as punishment for telling a lie about candy, and refused to let Savannah stop running even after the girl was vomiting and begging for an end to the exercise. In court, they cited a school bus surveillance video that captured Garrard saying she would run the girl and teach her a lesson. Garrard's family and friends had pleaded Wednesday for jurors to spare her life after, calling her a loving grandmother who endured an abusive childhood that included being beaten by her own grandmother. Garrard testified last week she had no intention of harming the girl and denied she had forced her to run. Garrard said during cross examination that Savannah wanted Garrard to help her get faster for races at school, and they both ran "a bunch" before Savannah collapsed. Bone argued that Savannah wouldn't want her own grandmother put to death.